Villages are being generated in very buggy ways. 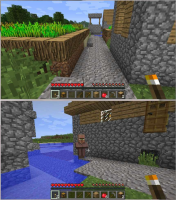 Certain times the path is uneven, or the farms are 1 block above the path (meaning you can't get at them). Houses with doors 2 blocks up with no stairs beneath. Found one on Seed 147896325 at x -247, z 325 that is a good example. MC-36020 Vilages spawn completly in chaos. MC-64330 Cobblestone under gravel path generates in caves! MC-64366 Cobblestone under gravel path generates in caves! MC-70533 If the village is sometimes generated this error. MC-87221 Villager house extending underground.